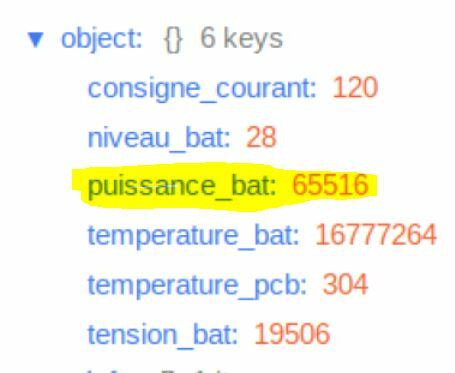 the variable “puissance_bat” should be ecale to "-20 " , maybe there something to do in decoding for signed data ? Provided that your initial interpretation of the bytes is as unsigned values before assembling them into a multi-byte unsigned word - which you then want to re-interpret as a signed 2’s complement value. here a part of code in node.js which convert an hex into a decimal and applied a mask according to the sign. @cstratton thanks, your solution really help me, i think that my uint16_t are overflow, i will put my variable to uint32_t. @julien i will try to use your exemple , thanks.